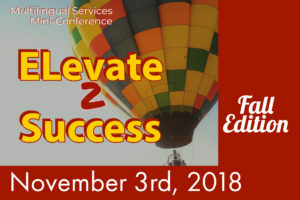 The Department of Multilingual Services is excited to announce that we will be hosting a second mini-conference entitled ELevate 2 Success: Fall Edition. The mini-conference will take place on Saturday, November 3rd. We are currently seeking high-quality teachers and leaders to facilitate breakout sessions. The purpose of the sessions is to empower educators to implement strategies that close the opportunity gap for our English Learners. The sessions for the conference will be one-hour in length, and presenters will have the choice to present in the morning, afternoon or both. P2P investors who are interested in facilitating a session need to submit a proposal using this Google Form. Those who are selected to participate will be compensated for their time. We look forward to sharing the expertise that we house in Klein ISD to better serve our students. We encourage you to submit your proposal by October 12th. Please reach out to your Language Instructional Specialist or the Multilingual Department if you have any questions or concerns.